The New England cottontail lives in parts of New England and New York. Over the last 50 years the range of this once-common rabbit has shrunk and its population has dwindled so that today it needs our help to survive. A critical threat is the loss of habitat – places where rabbits can find food, raise their young, and escape predators. Development has taken much land once inhabited by cottontails and other wildlife. And thousands of acres that used to be young forest (ideal cottontail habitat) have grown up into older woods, where rabbits don't generally live. Today the New England cottontail is restricted to southern Maine, southern New Hampshire, and parts of Massachusetts, Connecticut, Rhode Island, and New York east of the Hudson River - less than a fifth of its historic range. Thinking about how to help rabbits on your land? 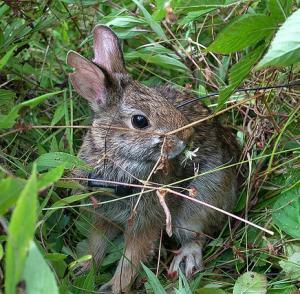 Check out these Best Management Practices for the New England Cottontail: How to Create, Enhance and Maintain Habitat. The New England cottontail's preferred thick habitat may last only 10 to 20 years before it thins out and no longer offers high-quality food and hiding cover. An increasing number of habitat projects are creating young forest and shrubland for cottontails. The new Great Thicket National Wildlife Refuge will preserve, create, and refresh young forest and shrubland in areas where cottontails live. Ongoing research improves our knowledge about New England cottontails and how they use their habitats. A captive breeding program boosts cottontail numbers and delivers fresh genes to wild populations. Conservationists have established a population of cottontails on an uninhabited island in Rhode Island's Narragansett Bay; biologists have released resulting offspring in different parts of the species' range. New England cottontails need brush, shrubs, and densely growing young trees, often called young forest. 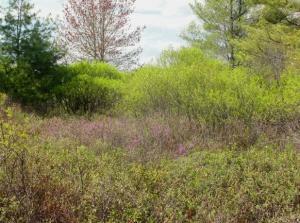 In the past, natural factors created plenty of this habitat. But today, because we don't let wildfires burn unchecked or beaver dams flood and kill trees, and because some people oppose timber harvests, we no longer have enough thick, vigorously regrowing young vegetation for New England cottontails and the dozens of other wild animals that live in such settings. Conservation partners, including state and federal agencies, towns, land trusts, companies, and private landowners, are actively making and managing habitat to help the New England cottontail. This same habitat is essential to migrating songbirds, game birds like the American woodcock and ruffed grouse, and reptiles such as the black racer and box turtle, to name but a few. 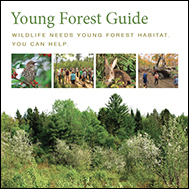 More than 60 kinds of wildlife in the Northeast require young forest during part or all of their life cycles. Making and renewing young forest is an ongoing task. We owe it to the wildlife - and to our children and grandchildren - to keep enough of this important habitat around. 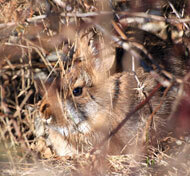 Explore this website to learn how conservationists are helping the New England cottontail. Support habitat projects that yield jobs, revenue, and sustainable, locally produced timber products along with more and better opportunities for birdwatching, hunting, and viewing wildlife. Most land in the Northeast is privately owned, so landowners can help wildlife in a big way by signing up to make habitat. Town select boards and conservation commissions can propose projects on municipal lands, and land trusts can make young forest on their holdings. Contact a natural resource professional to learn more. 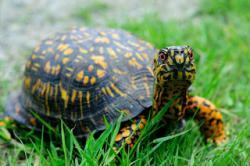 You can also get advice from your state’s wildlife agency, the U.S. Fish and Wildlife Service, the USDA Natural Resources Conservation Service, or a certified forester with knowledge of wildlife habitat needs. For some projects, full or partial funding may be available. Read Saving a New England Native (pdf), an article on New England cottontail conservation from Northern Woodlands Magazine.